Egypt’s real-estate market is in a slump. People’s purchasing power has declined with a rise in the prices of properties on the back of costlier building materials and land, and this has led to a series of setbacks in the property market. 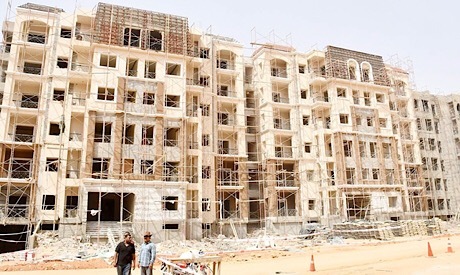 After the floatation of the pound in November 2016, the prices of building materials almost doubled, said Afifi Fahmi, a member of the Real Estate Investment Division at the Federation of Egyptian Chambers of Commerce. He cited the price of a ton of aluminium, which cost LE6,000 before the floatation and is now LE12,000. The overall cost of real-estate projects increased, causing a slowdown in sales that is estimated at 80 per cent, he said. People who were able to buy property when a ton of steel cost LE1,400 can often no longer afford it when steel costs LE12,000 per ton, Fahmi explained. Few people can spend more than 40 per cent of their income on real estate, and with the price rises the purchasing power of customers has plummeted, he added. People who could afford to buy a house for LE100,000 two years ago can often no longer do so after prices have doubled, said Mamdouh Badreddin, head of the Real Estate Investment Division. Besides the increasing prices and decreasing purchasing power, real-estate developers are also faced with the reluctance of the banks to finance projects. “If the banks do not want to fund real-estate projects, how can investors complete them amid the hiking prices,” Badreddin asked. However, he hoped that in two or three years, sales in the real-estate market would regain momentum as salaries and economic growth pick up. GDP growth in Egypt in the second quarter of the current fiscal year recorded 5.3 per cent, with all sectors seeing positive growth. The construction sector recorded growth of 8.9 per cent, becoming one of the five achieving the highest rates. The weakening demand for property has led many real-estate investors to offer buyers attractive payment facilities, such as reduced down payments and longer instalment plans. Construction costs have increased by 80 per cent since the floatation of the pound, acknowledged Alaa Fekri, a member of the Real Estate Investment Division, adding to the investors’ burdens. In one project, the price per square metre was LE3,400 in the first phase three years ago, but LE9,000 in the last phase last year, he said. The market slowdown has been particularly acute in luxury property, while demand for smaller units still exists, albeit less than three years ago. The slowdown began to be felt late last year, Fekri said. He added that investors were being forced to offer better financial facilities to their clients because they sometimes either have to settle for less profit or shut down altogether. Fahmi said the Central Bank of Egypt (CBE) should increase the maximum amount that could be borrowed in mortgages for medium-size units, currently LE950,000. With the rising cost of construction, the price of one square metre has sometimes reached LE10,000, meaning mortgages are limited to units measuring 100 square metres, he said. Fekri said that increases in the price of land had limited developers’ ability to buy land to initiate new real-estate projects. The current high interest rates had also encouraged developers to deposit their money in the banks, opting to receive interest payments instead of risking money on housing projects, he added. A report by local investment bank Pharos Holding anticipated a slower real-estate market this year, despite the longer plans offered by many developers. The report expected a five per cent increase in prices and a 10 per cent rise in construction costs. A report by Jones Lang LaSalle Cairo, a US-based real-estate consultancy, said the sector had yielded positive results in 2018, but that resale values had been affected because buyers preferred to invest in units under development to take advantage of easier payment facilities.